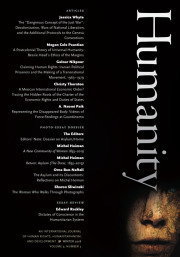 Humanity aims to publish a limited number of dossiers a year. Dossiers are collections of articles plus an introduction that together advance a novel debate, idea or field in relation to the overall aims of the journal. Humanity does not give over a whole issue to a dossier, but will consider collections that total up to 50,000- 60,000 words. A dossier should include a substantive introduction within this word limit. The acceptance of a dossier proposal does not guarantee that all its articles make it through peer review. The journal editors will retain editorial control over the dossier, and editorial decisions remain with the journal editors. The proposal should include a two-page outline of the overall theme of the dossier, pointing out in particular (a) what is new and noteworthy about this particular collection, and (b) what the advantage is of making this point through a collection of articles, rather than by publishing the articles in different outlets. The proposal also includes a list of prospective articles and their authors, with one-paragraph summaries of their contents and relevance for the overall dossier.